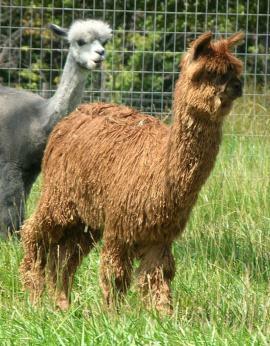 Peruvian - USA Peruvian Jaguar is a full Peruvian, 3/4 Accoyo dark brown son of Accoyo Kalvin (Jackpot son). Jaguar's dam, Jewell, is a bay black MacGyver daughter, and she's no slouch either. This combination of quality genetics, including Bruxo, Starbuck and Jackpot, has proven to be something to get excited about. Jag has incredible density, brilliant luster, and great lock, all topped off by massive bone structure on a very square frame. 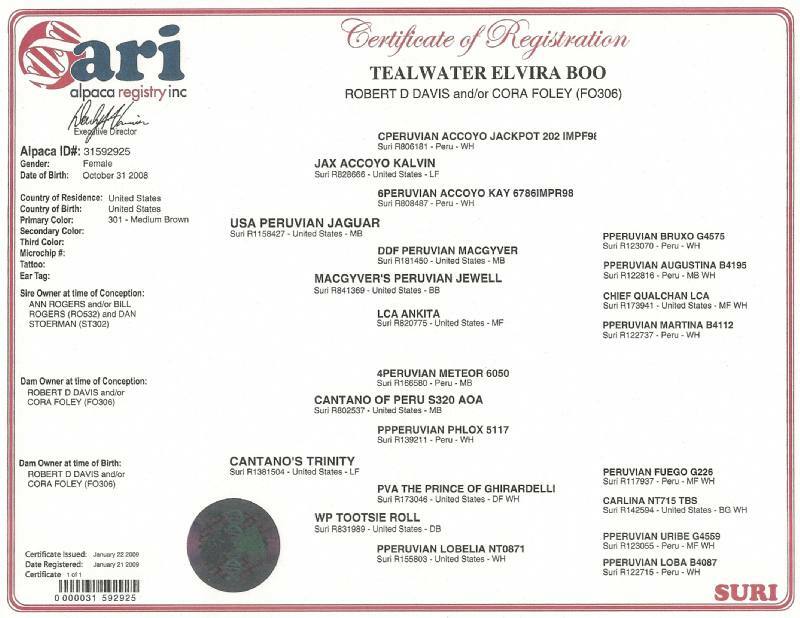 Jaguar's sire is Jax Accoyo Kalvin, a light fawn 5 time color champion including Color Champion at the 2004 AOBA nationals in Louisville. This sweet little girl born on Halloween has been a real treat! Boo is exactly what we are striving for in our breeding program. She is the result of carefully chosen bloodlines and a pedigree packed with top Suri genes from across the country. 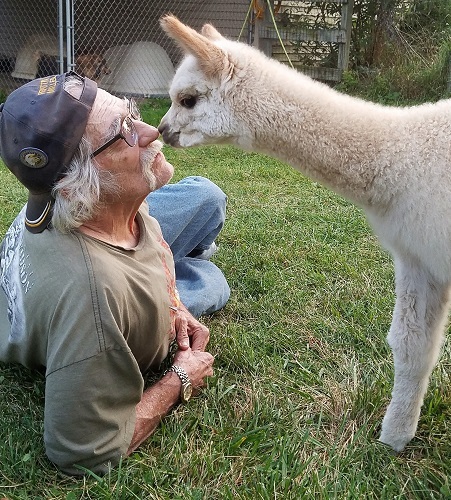 Her dam is our foundation suri, sired by Cantano of Peru world record setting highest selling alpaca in 2003 - genetics that are no longer available as Cantano was killed in a tragic farm accident. Boo's pedigree boasts such well known quality producers as Bruxo, Fuego, Uribe, Macgyver, Kalvin, Cantano, Chief Qualchan, Prince of Ghirardelli...and she does all her ancestors proud! Boo's show career took off to a fantastic start. Her first showing was the first all Suri National Sweepstakes held in Findlay, Oh Sept. 2009. This was a non-AOBA show with three judges: Lavona Fercho, Canada; Mary Reed, US; and Dr. Rufino Quilla from Peru. Many of the top Suri breeders in the country entered this inaugural event. Boo was in a class of eight brown Suris ranging from 6-15 months old, and the three judges were unanimous on their first and second place picks...Boo stood in second place behind Wilkin's WLK Sophora. 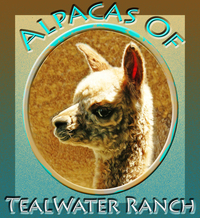 Boo won Color Champion over Sophora one month later, worth mentioning because Sophora was highest selling alpaca at the 2010 Futurity at $70,000! Boo's second show was the MIAF in Sept. 2009, where black and brown Suri females were grouped for a Dark Color Championship. At MIAF Boo walked away with her first Color Champion under judge Diana Timmerman. 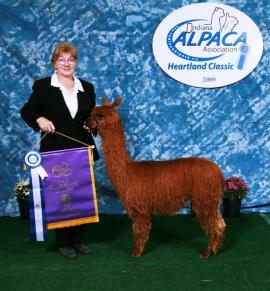 Her third time in the ring was the Indiana Heartland show, Oct. 2009. 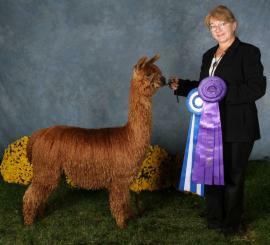 Again, from the juvenile class, Boo won Brown Color Champion under judge Amanda VandenBosch. Comments from the judge included "she is really packing on the fleece". Her luster, exceptional fineness, extreme density and lock structure and consistency are fantastic! 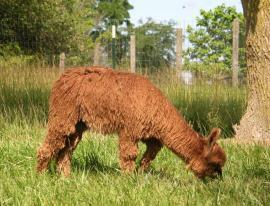 If you're looking to build your suri herd with the best of the best, this girl should be in your herd!